The best way to upgrade your PS3 hard drive is cloning your PS3 hard drive to SSD. AOMEI Backupper is the great assistant for your clone process. PS3 is the abbreviation of the PlayStation3. It is a home video game console developed by Sony Interactive Entertainment, formerly Sony Computer Entertainment. The PS3, aside from being a game console, is also a pretty powerful media center. But a media center with limited memory would influence its function. It does not have enough hard drive space to store all that many game installs. Another main reason of upgrading PS3 hard drive is that you can have better game experience by upgrading hard drive. Therefore, it is necessary for you to upgrade your PS3 hard drive. What you need to do for upgrading your PS3 hard drive? To upgrade your PS3 hard drive, you need replace your PS3 hard drive with a larger storage device. This device can be a HDD, SSD. What should we choose? 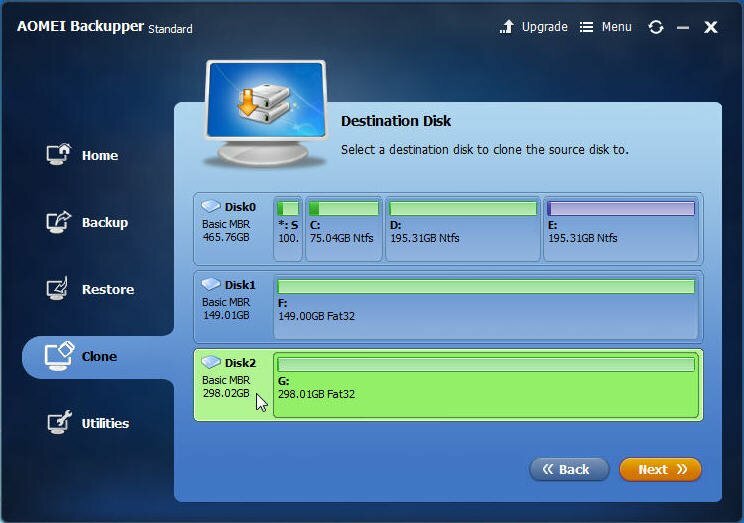 After make a comparison between HDD and SSD, we find SSD is much better than HDD. SSD uses flash memory to store data, which provides better performance and reliability. And with the development of technology, its price is decreasing. So it is highly recommended to upgrade PS3 hard drive to SSD. By cloning your PS3 hard drive to SSD, you do not need to reinstall the games that you installed before. And a Phillips screwdriver is necessary for removing the PS3 hard drive and installing the SSD. The following are the other things you need when upgrading your PS3 hard drive: a desktop computer running Windows 10/8/7, two regular SATA cables and SATA power cables. Most importantly, a clone software which can clone your PS3 hard drive to SSD is the critical tool in the upgrade process. How to upgrade your PS3 hard drive? Choosing a clone software for the cloning process is essential. AOMEI Backupper is the best suitable clone software which can perfectly perform the clone function in an easy way. It can save your time and energy for its easy to use feature, and its intellectual user interface give customers ideal experience. Besides that, AOMEI Backupper is a freeware which offers you the best clone service. ● Pull out your original PS3 hard drive and use the screwdriver to free up the frame that holds the had drive. Then connect it to the available spare port in your desktop computer. ● Connect your SSD to another available port in the same computer. ● Generally speaking,a new SSD needs to be initialized, partitioned and formatted as NTFS by default before it can be used. But PS3 can only read partitions formatted with FAT32 file system instead of NTFS. The good news is that you use AOMEI Partition Assistant to convert FAT32 to NTFS. Step1. Download AOMEI Backupper, install and launch it. 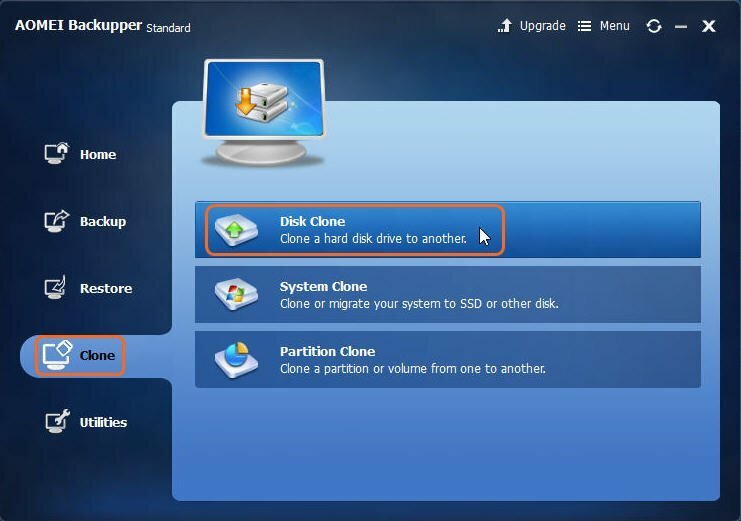 Click Disk Clone under the Clone option. Step2. Select the disk(Disk1) that you wish to clone. Click Next to continue. Step3. 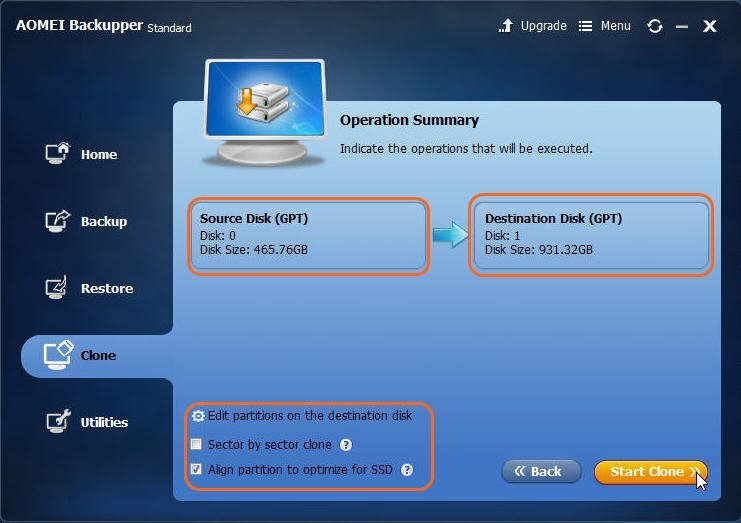 Select a destination disk to clone the source disk to. Then click Next. Step4. You can see an Operation Summary which indicates the operation that will be executed. Confirm the detail, then click Start Clone to begin the clone process. You need to convert the file system of SSD from NTFS to FAT32 using AOMEI Partition Assistant. And then install the SSD into the PS3. In the left corner of the Operation Summary, there are three options for your choice. It is recommended to check the Align partition to optimize for SSD.